The six large windows which are on the left side of the sanctuary measure ten feet in height and two feet in width and portray the life of Christ through symbols. The birth of Christ is symbolized by the manger scene and in the manger the very ancient sign of Christ the Chi-Rho, also the sign of life shown by the Lily. At the time of birth the star appeared and the three kings came from the East. The second window symbolized the presentation of Christ for circumcision, showing the two pigeons which were given as gifts to the poor. The Chi-Rho again symbolizes the presence of the Christ child in the temple depicted by the seven branch candlesticks and a scroll, symbolizing the discussion with the law teachers. The shell of John the Baptist, the Chi-Rho, and the symbolic descent of the Holy Spirit are the appropriate symbols of Christ's baptism. Following his baptism He went out and called His disciples. The upper portion of the window shows the Chi-Rho and the twelve lights representing the twelve apostles. 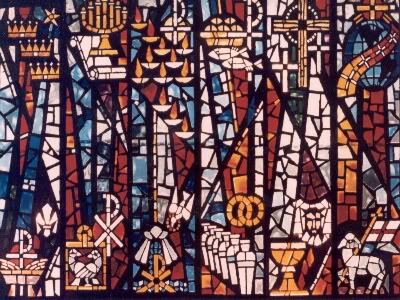 The lower section depicts the six jars and the interlocking wedding rings, the sign of the Miracle of the Wedding of cana. The upper portion of the window depicts the feeding of the multitude after the blessing of the two fishes and the loaves of bread. The chalice is the sign of the Last Supper. The three drops of blood represent Christ's falling three times. The crown of thorns is shown and in the background the veil of the temple which was rent from top to bottom. The top portion of the window shows the three crosses of Cavalry. Behold the Lamb of God the triumphal sign of life over death, the last enemy of man having been defeated. The top portion of the window portrays Christ in the World, the resurrected Christ, "Lo I am with you always, even until the end of the world."